Trusts are a smart way to pass on assets. First off, they allow the settlor, or trust creator, to ensure that the desired people and institutions inherit the right money and property when he or she has passed away. And as many financial advisors will tell you, trusts can also be a great way to lower the burden of estate and gift taxes. But thanks in part to laws surrounding trusts, some states are more popular places to set up trusts than others. 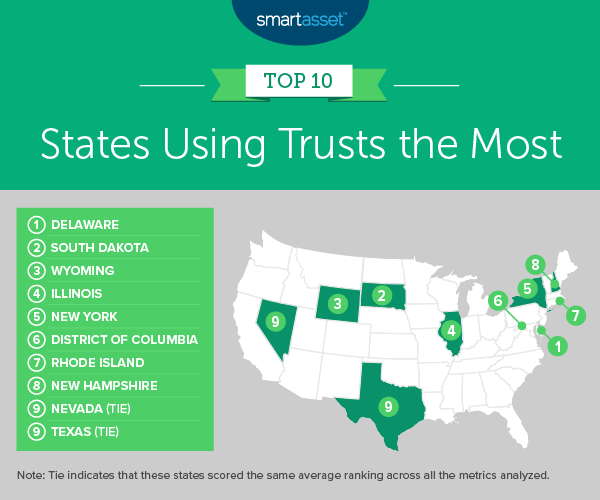 Below, we look at data on trusts to find the states using trusts the most. In order to rank the states where trusts are most popular, we gathered data on three factors. We examined the number of trusts per 1,000 households, average income per trust and average deduction per trust. Check out our data and methodology below to see where we got our data and how we put it together to create our final rankings. Low tax states - The states in this top 10 with the largest trusts tend to have low or no additional state taxes. This list includes South Dakota, Wyoming, Nevada and Texas. Estate tax states - States with additional estate taxes on top of the federal estate taxes are also found in this top 10. For example, Illinois, New York and Rhode Island, along with Washington, D.C., all levy a state estate tax. Trusts in these states tend to be smaller on average but more numerous. Delaware has a reputation as a favorable place for setting up different kinds of financial arrangements. As an example, you may have noticed that many corporations and businesses are incorporated in the First State despite having no relationship to it. According to our analysis of IRS data, Delaware ranked in the top three for all of our metrics. There are more than 50 trusts per 1,000 households in Delaware, and the average trust here has an income just under $185,100. Not as many trusts are set up in South Dakota as in Delaware, but the ones that are set up here are large. The average trust in South Dakota has an income just short of $262,000. At the same time, the average trust has deductions worth more than $103,000. In both metrics, South Dakota ranks first. South Dakota also has a long history of being friendly to trusts. It was one of the first states to allow trusts to exist in perpetuity. One reason people may choose South Dakota to set up a trust is that the state does not have additional state income or capital gains taxes for assets in trusts. Because Wyoming has no additional state estate or income taxes, it is an ideal place to set up a trust. According to our analysis of IRS data, there are more than 28 trusts per 1,000 households, the eighth most in the study. On average, these trusts have an income of $145,651. Trusts in Wyoming are also able to deduct a large amount of taxes. The average trust in Wyoming has deductions worth $73,100, the fifth-highest amount in our study. There are more than 189,000 trusts set up in Illinois, one of the highest numbers in the country, according to our analysis of IRS data. Illinois has a fairly high progressive estate tax, only taxing estates worth more than $4 million. That may make it worthwhile to set up a trust in Illinois. Though trusts are common here, the average trust is on the smaller side for this top 10. Illinois ranks 11th and 15th for income per trust and deductions per trust. New York is another state with a progressive estate tax, ranging from 3.06% to 16% based on the size of the estate. New York has no additional inheritance tax, so the heir of an estate has to pay no additional taxes after the estate pays the estate taxes. New York trusts are larger than in most states. In both income per trust and deductions per trust, New York ranks in the top 10. Washington, D.C. is another locale with an estate tax, perhaps the reason people choose to set up trusts here. The average trust here has an income just greater than $69,000 and average deductions of $43,271, two top-10 scores. The nation’s capital falls behind other states ranked above because of the lack of trusts relative to its population. Washington, D.C. has just 20.9 trusts per 1,000 households. Another state with an estate tax takes seventh. Rhode Island’s estate tax kicks in for estates worth more than $1,537,656. The tax tops out at 16% for taxable estates worth more than $10.04 million. This may explain why so many trusts are set up in Rhode Island. This state has more than 53 trusts per 1,000 households, the second most in the country. Trusts here are slightly smaller than trusts in other states in this top 10, though. That pushes Rhode Island down the ranks. Trusts in New Hampshire are somewhat large on average. According to IRS data, the average trust in New Hampshire has an annual income just shy of $100,000. Despite their size, trusts don’t garner much in the way of a tax deduction here. The average deduction for trusts in this state is $27,760, the majority of which comes from taxes paid and fiduciary fees. Because it has no estate tax or additional income tax, Nevada is a great place to set up a trust. Trusts that are set up in Nevada tend to be large. The average estate here has an income above $149,100 and deductions worth $80,350. In both of those metrics, Nevada ranks third. The reason Nevada falls to ninth is the relatively low number of trusts in the Silver State. Nevada ranks 36th for trusts per 1,000 households. Finally, our list of the states using trusts the most ends in Texas. This state has almost 19 trusts per 1,000 households, a fairly low mark. But on average, trusts here are pretty large. The average trust in Texas has an income greater than $82,600, with average deductions worth just less than $42,000. In those two metrics, Texas ranks in the top 10. Trusts per 1,000 households. This is the number of trusts per 1,000 households. Data comes from the IRS and is for 2014. Data on households comes from the Census Bureau’s 2017 1-year American Community Survey. Average income per trusts. This is total net income divided by the number of trusts. Data comes from the IRS and is for 2014. Average deductions per trust. This is total deductions divided by the number of trusts. Data comes from the IRS and is for 2014. We then ranked each state in each metric. After, we found each state’s average ranking. We created our final score based on this average ranking. The state with the best average ranking received a 100. The state with the worst average ranking received a 0. Ask an expert - Estates are complicated. Ensuring that you effectively use a trust to lower your tax burden and bequeath as much of your estate as possible to your heirs is no easy task. So why not leave it up to a trained expert? A financial advisor can manage your estate to make sure your heirs get the most out of your assets. If you’re not sure where to find a financial advisor, check out SmartAsset’s financial advisor matching tool. It will match you with up to three local financial advisors who fit your investing needs. Update your will and living trust - Circumstances can change quickly. You may find yourself with an unexpected illness or windfall you did not anticipate. With that in mind, it is a good idea to keep an up-to-date living will and make sure your living trust is in order. This will help your executor fulfill your final wishes.